Well, have you also asked yourself why everyone considers German grammar to be such difficult? As in every other language, you just need a good dictionary and you are ready to at least write texts in German. Unfortunately, the German language is not that easy. Once you have reached a certain level, you will need subordinate clauses to express more information in one sentence. And what’s in between? Exactly, conjunctions and pronouns. 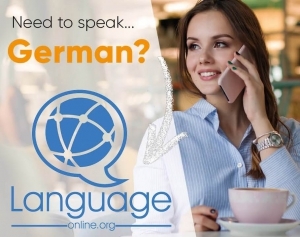 So, in this article on language-easy.org I’d like to talk about a specific type of German subordinate clause, the German relative clauses. In the following, I’d like to talk about the different types of German relative clauses and also give a short description of this subordinate clause. Also the construction of these sentence and their word order will be a topic. Finally, I’d like to mention German relative pronouns and relative adverbs. First of all we will describe what a German relative clause actually is. So, German relative clauses can add additional information about a noun without beginning a new clause. Furthermore, they can be used to combine two main clauses. It is also important to know that German relative clauses are always introduced by relative pronouns: “der, die, das” for people and things. German relative clauses are always set off by commas. Well, as we have seen in the description, German relative clauses can give additional information about subject or object and, additionally, convert to main clauses into a complex clause. So, that’s why a German relative clause can be in the nominative, accusative, dative and genitive case. In the following, I’d like to give you some examples that illustrate what I mean. Later on we will talk about each of these conjunctions. So, normally, these elements come directly after the subject or the object to which they refer. Of course, this can be in the middle of the sentence or at its end. Please, keep in mind the verb in a German relative clause is always put at the end of the sentence. Now, let’s have a short look at this table. Here, you will see the German relative pronouns “der” and “welcher“. Of course, they are shown in different cases, number and gender. “Philip, den ich sehr gerne mag, hat einen Hund.” – Philip, who I like very much, has a dog. By the way, you should keep in mind that mainly the relative pronouns “der, die, das” are used in German, whereas “welcher, welche, welches” are not so common. Nevertheless, they are used to avoid the repetition of words. “Das ist die Frau, die die Kuchen verkauft.” – That’s the woman who sells pies. “Das ist die Frau, welche die Kuchen verkauft.” – That’s the woman who sells pies. 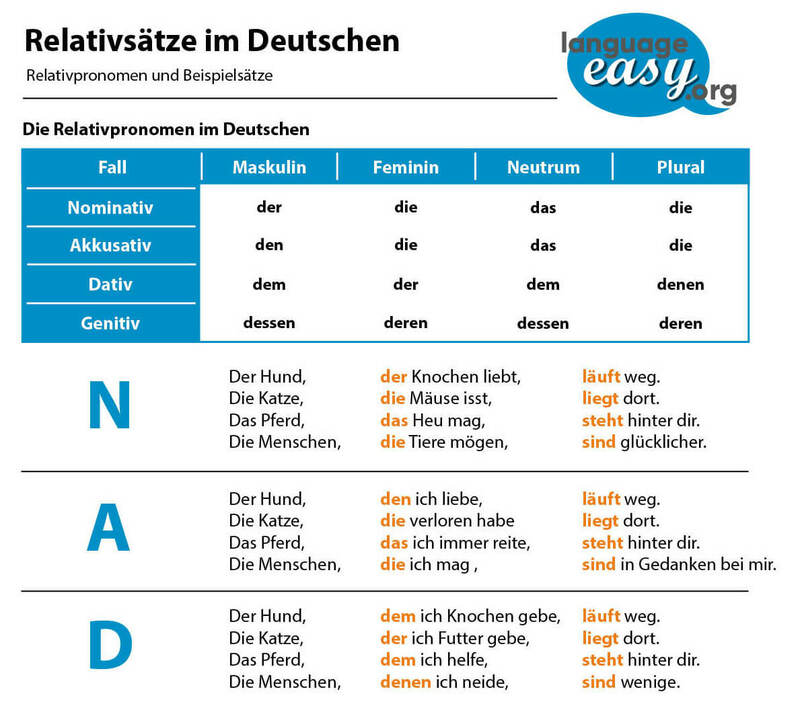 Finally, we will come to the last point of this article, the German relative adverbs. Well, this point is not too complicated. Just keep in mind that relative adverbs do not change their form. So, they often refer to an entire clause rather than a single noun. Some relative adverbs are, for example, “was, wo, womit, wofür, worüber“. “Philip hat einen Hund, was mir sehr gefällt.” – Philip has dog, which I like very much. “Philip wartet dort, wo der Bus steht.” – Philip waits there where the bus is. “Peter weiß nicht, wofür er hier ist.” – Peter doesn’t know for what he is here. “Ich weiß nicht, worüber der Film handelt.” – I don’t know what this movie is about.